KAMUT® brand khorasan wheat is an ancient grain, guaranteed under the KAMUT® brand, to never be hybridized or genetically modified, always organically grown, and is prized for its nutrition, ease of digestibility, sweet nutty-buttery taste and firm texture. It is an excellent source of protein, fiber, and many vitamins and is high in minerals including selenium. Khorasan is a variety of wheat and has gluten. However, many people with sensitivities to modern wheat report being able to eat KAMUT® khorasan wheat with no difficulty and thus that it is an excellent alternative to modern wheat. We support ongoing research to understand this phenomenon. KAMUT® khorasan is an ancient grain that has not been changed through modern breeding programs. It is our theory that it has retained many desirable qualities that have likely been lost or changed through the intensive breeding programs that have significantly altered modern wheat. KAMUT® khorasan wheat is grown on certified organic farms primarily in the Northern Great Plains of North America where the dry climate similar to its origins, ensures the best quality is consistently obtained. Khorasan wheat is distinctive. 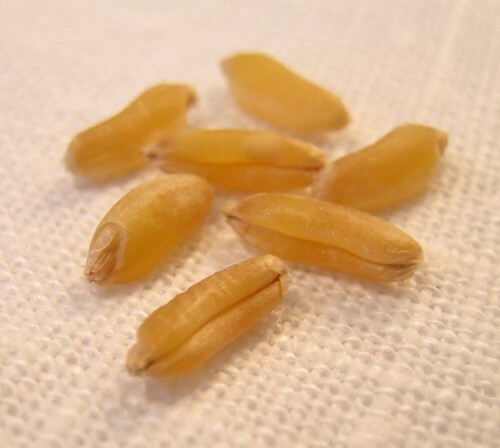 It is about three times larger than most modern wheat, is elongated with a pronounced “hump”, and is uniquely vitreous with a rich golden color. Most likely originating in Mesopotamia, legends exist of this grain being found in Egyptian tombs. Farmers in Turkey call the grain “Camel’s Tooth” because of its shape or the “Prophet’s Wheat,” referring to another legend that Noah brought the grain with him on the ark.